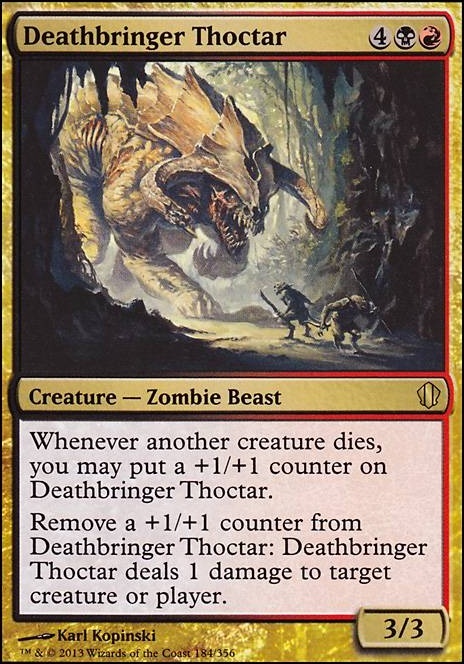 Whenever another creature is put into a graveyard from the battlefield, you may put a +1/+1 counter on Deathbringer Thoctar. 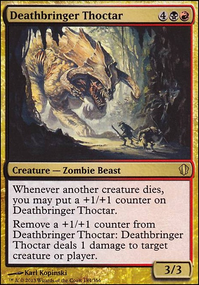 Remove a +1/+1 counter from Deathbringer Thoctar: Deathbringer Thoctar deals 1 damage to target creature or player. Enker To be Honest Tymaret, the Murder King is really only good because you can infinite combo and pop off with his first ability, but it just costs so much to really make it efficient with out a engine going. Infect is an idea but it i don't see it strong enough to really make a insane impact, it is something to look into and i will thanks for the tip..
Like you said you can try out a full on steal everything deck with him and just play him really controlling, by taking everyone else's win cons Praetor's Grasp and slowly making something like Deathbringer Thoctar Really big or just keeping the game going so long that Mogis, God of Slaughter & Purphoros, God of the Forge Has made a huge impact on the game. 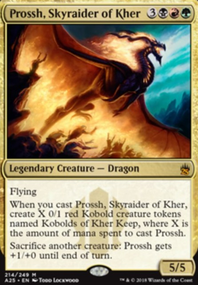 If your dead set on the legend Tymaret, the Murder King He is pretty great You could honestly just get rid of Worldgorger Dragon + Phyrexian Altar to remove the infinite combos and just slowly zucc out everyone with Blood Artist . 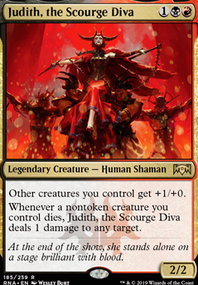 If your looking for a commander that doesn't need infinite combos and "It seems your down for a infect build" you can try to make a Judith, the Scourge Diva & Grafted Exoskeleton Infect deck to slowly ping down your friends with infect. You can easily give her death touch to wipe a board if your play group is fine with that match up. There is a surprising amount of counter generation here, I like it. Deathbringer Thoctar , Maga, Traitor to Mortals , Ashling the Pilgrim , Walking Ballista are all solid options to include. The Scorpion God , Cauldron of Souls , Retribution of the Ancients these allow you to spend the +1/+1 counters or remove them from creatures with undying so that they can keep undying. Mikaeus, the Unhallowed allows your creatures to be sac'd twice since they recur the first time. Deathbringer Thoctar also helps convert deaths into damage, but he can also go infinite with mikaeus since he can shoot his +1 counter before dying each time, allowing him to undie forever! Goblin Bombardment is a really really good enchantment, especially for what you're doing. Gotta add that in! Viscera Seer is also one of the best sac engines out there along with the g e Altars and Bombardment. High Market and Phyrexian Tower are great sac engines lands. One of my favorite cards in my Shattergang Brothers deck (or pretty much any deck really) is Feldon of the Third Path. 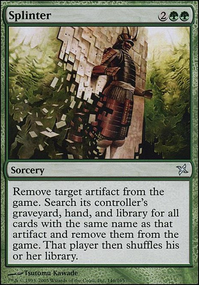 It's a great way to recur value creatures, and even turns them into artifacts to give you more options sacrificing them to your commander. I'm not sold on Undying Rage being the third-best recurring enchantment in this deck. Normally I wouldn't be a huge fan of Rancor either, but you have such a high density of heavy hitters that I think it's worth it. In place of Unstoppable Rage, I think either Fallen Ideal or Glistening Oil would be better. Glistening Oil would help your beaters kill at a much smaller size, while Fallen Ideal would be nice as a free sacrifice outlet to make sure creatures you want to recur make it to the graveyard. One card that would fit really well in your build would be Pitiless Plunderer. It generates mana so you can activate Shattergang Brothers multiple times in a turn, and generates artifact tokens to serve as fodder for his ability. Finally, another of my favorite cards for Shattergang is Deathbringer Thoctar. 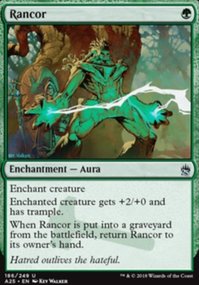 It lets you ping off 1-toughness creatures for free to make Shattergang's sacrifice triggers more impactful, and grows out of control really quickly as creatures die. ZendikariWol thanks for the suggestions, the more feedback the better. There is a decent amount of removal in my meta and one particular person likes to play mil, however I don't plan on needing to recur things for the most part and only use it as a panic button which is why all of my recursion is either continuously effective, pulls the entire graveyard, or targets several cards at once. Rage Forger was specifically included to get around the "attack one player" restriction since it targets any player, allowing me to spread the damage around. Solidarity of Heroes Doubles as a combat trick, but even if I only use it on a single creature, lets say one that has 4 counters on it, then I get 4 counters for 2 mana which I find decent enough. I understand the Lifeblood Hydra has a bad mana curve and have avoided running it up until now, but with so many ways to produce and move counters it will continue to grow even after being played. Vraska is mainly run for her ultimate, I know that is generally frowned upon but she doesn't require you sac something, it is a may ability. If she happens to be put down with a doubling season it will only take her 2 turns to ulti, and if not then it gives the less aggressive decks a reason to attack me and as a result, I am able to attack them. I considered using Vraska, Scheming Gorgon instead but she had a higher CMC and the ulti only lasted for a turn. Both Triskelion and Walking Ballista are combo pieces (the same piece to be specific, in order to raise consistency, along with Deathbringer Thoctar. Balefire I considered mostly as a repeatable removal, a 7/7 with flying and menace is hard to block, especially multiple times in a row. The rest I'll take a look at removing. Bloodchief Ascension can do the same thing as Duskmantle Guildmage. By adding Ascension, you'd have another card to work with Mindcrank. 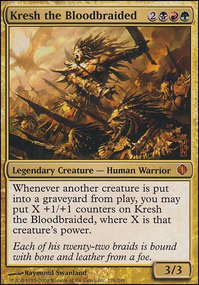 We also figured Blood Artist, Zulaport Cutthroat and Deathbringer Thoctar could be some nice combo pieces in a deck that tries to capitalize on the death of creatures.